Paul Stanley gets his "Rose" tattoo on this day by artist Lyle Tuttle. Gene Simmons on "KISS the Reality Show"
"Everything is about size" and the upcoming KISS reality show is going to be anything but modest! 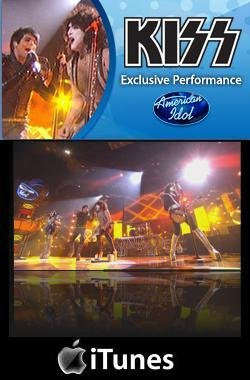 KISS AMERICAN IDOL CLIP - #1 FOR 10 DAYS!! 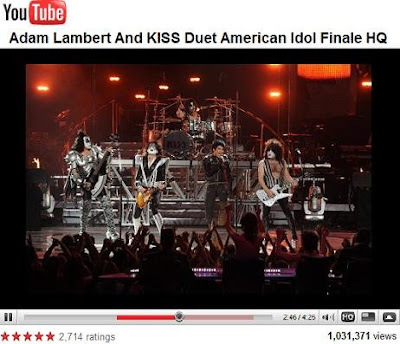 The KISS / Adam Lambert American Idol Medley clip is the #1 best selling Music Video on iTunes for the 10th straight day! CLICK HERE to purchase the clip . KISSOLOGY Volume 1 is now available in Australia, Belgium, Brazil, Czech Republic, Denmark, England, Finland, France, Germany, Greece, Italy, Japan, Luxemborg, New Zealand, Norway, Poland, Scotland, Spain and Sweden. The DVD set will be released in Russia on June 6. KISS' "I Was Made For Lovin' You" was voted the #1 greatest rock hit by the readers of Austria's Krone Newspaper! Thanks to Hans-Ulrich Zingg for sending us the newspaper image. Here is the tally so far for "Demand" KISS in your city. It seems that Canada is dominating the Top 10 City positions. KISS made headlines last month when it announced its U.S. and Canadian tour will be the world's first to put fans in charge of where a tour is routed. This is destined to be the most explosive show of the year; and by partnering with web site Eventful, fans will "Demand" exactly where KISS and will perform in (top-voted) North American markets beginning this September. 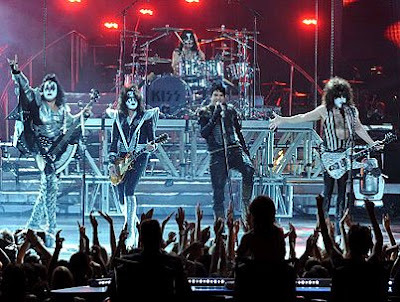 An official video announcement by the band's Paul Stanley, Eric Singer, Tommy Thayer and Gene Simmons (see video at KissOnline.com), shot in front of a capacity crowd in Santiago, kicked off this first-ever tour promotion. With tens of thousands of their Chilean counterparts cheering in the background, North American fans were astonished to learn that they were being put in charge of routing their favorite band's upcoming tour. Gene and Paul were on "The BJ Shea Morning Experience" this morning. The show is heard on KISW 99.9 FM. in Seattle. NICE, BUT CAN THEY BREATHE FIRE? No, KISS wasn't in town, but this was the next best thing. 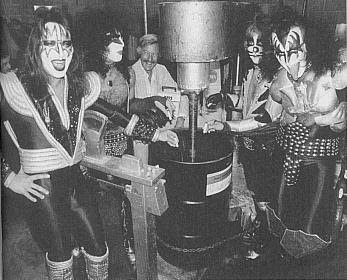 Members of the Tsongas Arena's management, including box-office manager Carla Dubiel , General Manager Craig Gates, Ralph Martin, who works in operations, and ticket seller Sarah Mallard, donned the black-and-white makeup of 1970's rockers KISS and assaulted the downtown, shilling for votes to "demand" that KISS play the arena. The crew got the attention of Lowell Police Superintendent Ken Lavallee. After determining that they were not just a group of looting hoodlums, his vote was won and, being a good sport, he even had his picture taken with them. The band is holding an online contest to determine where they will play this summer. To demand that KISS play the Tsongas Arena, go to www.eventful.com/KISS and demand Lowell, MA 01852. Voting ends June 30. 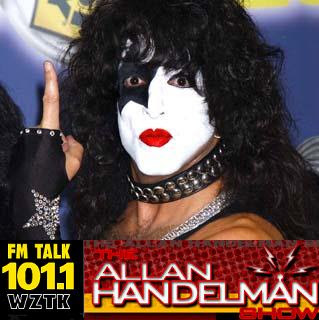 KISS' guitarist/vocalist Paul Stanley will guest on the "Alan Handleman Show" on Friday, May 29 at 4:00 p.m. EST. The program can be heard live on North Carolina's FM Talk 101.1 (WZTK). You can listen to the show live via the Internet at this location. Preview Of Gene on A&E's "Private Sessions"
Gene Simmons is the guest at this Sunday's Private Session on A&E. Taped in a small intimate studio in New York City, "Private Sessions" showcases exclusive performances and intimate conversations with the top names in the music and movie industry. Each Sunday morning at 9:00 a.m. EST, "Private Sessions" explores the body of work of a single artist or group. It also includes perfomances of current releases as well as career-building, influential or defining songs and/or movie projects. The 360 set follows on the heels of the popular KISS Ikons set that Press Pass released earlier this year. See more on it here and here. There will be a 90-card base set, made up of several subsets — nine Unmasked cards, nine The Demon Speaks cards where Simmons “reveals the secrets to his success,” nine 2009 cards with highlights from this year, 18 Behind the Curtain cards, 12 Road Stories cards, nine Behind Starry Eyes cards, six Welcome to the Show cards and 18 Albums cards focusing on, well, their albums. Tommy Thayer is featured on the cover of the latest Spanish 'Guitarra Total' Magazine! The issue includes a 6 page interview with Tommy. Gene To Guest On A&E's "Private Sessions"
Gene Simmons will appear on A&E's "Private Sessions" this coming Sunday, May 31 at 9 a.m. Eastern/8 a.m. Central. "Private Sessions " is hosted by Lynn Hoffman and showcases exclusive performances and conversations with top names in contemporary music and film. 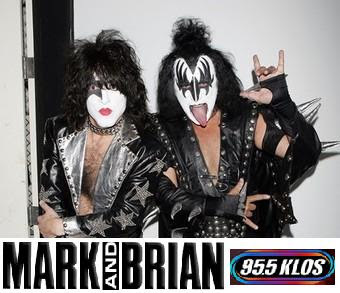 Will topics of discussion include the new KISS album? Tune in and find out...View some behind-the-scenes footage of Gene's appearance HERE. Legendary band KISS made headlines last month when they announced their U.S. and Canadian tour will be the world’s first to put fans in charge of where a tour is routed. Now, KISS is adding even more excitement to their tour as they announce the selection of Buckcherry as opening act. This is destined to be the most explosive show of the year; and by partnering with Web site Eventful, fans will “Demand” exactly where KISS will perform in (top-voted) North American markets beginning this September. Buckcherry fans can now join the hundreds of thousands of KISS fans that have voted to date at www.eventful.com/KISS. They have just six more weeks—until voting ends on June 30th— to “Demand” what cities they want to see the tour hit. 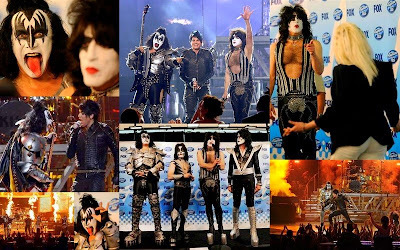 No matter where the fans say—“from stadiums to cornfields”--if there are enough votes, the KISS tour will be there! And in order to keep the competition fair for smaller cities, final site selection will weigh population size versus total votes. More than 8,000 cities and towns are already represented on the fan-submitted list. Just for voting for their town, all KISS and now Buckcherry fans will have the opportunity to purchase pre-sale tickets prior to the general on-sale and will also receive KISS merchandise discounts and more. In addition to joining in on the major campaigns launched by rock radio in each city, fans are also incentivized to create their own viral videos online, motivating their fellow residents to participate in casting votes for a KISS show in their city. City-specific “best-of” compilation reels of these videos will be shown on jumbo screens at venues before each concert. KISS just wrapped up an astonishing trek through South America, where fans hailed the band at sold-out stadium shows across the continent. From the Hipodroma la Rinconada in Caracas, Venezuela to the River Plate Stadium in Buenos Aires, Argentina, KISS treated fans to a set of some of rock’s greatest hits, including “Rock and Roll All Nite,” “Detroit Rock City,” “God Gave Rock & Roll to You” and “Shout It Out Loud,” and more. The group’s 2009 South American tour also included sold-out dates in Santiago, Chile; Rio de Janeiro and Sao Paulo, Brazil; Bogota, Columbia and Lima, Peru. 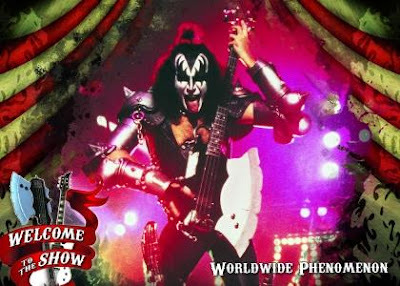 An official video announcement by the band’s Paul Stanley, Eric Singer, Tommy Thayer and Gene Simmons (see video at www.KISSonline.com), shot in front of a capacity crowd in Santiago, kicked off this first-ever tour promotion. With tens of thousands of their Chilean counterparts cheering in the background, North American fans were astonished to learn that they were being put in charge of routing their favorite band’s upcoming tour. KISS, which has garnered more than 30 gold and platinum records and sold in excess of 90 million albums worldwide, is currently recording its first new studio album in 11 years. The band will release exciting news about the album (produced by Paul Stanley) at www.KISSonline.com in June. 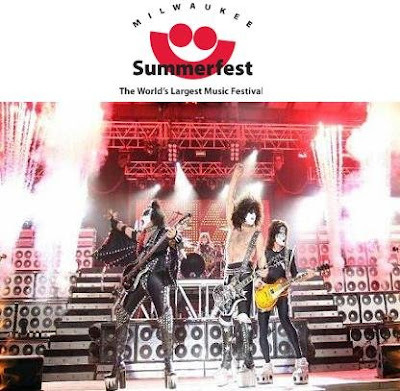 KISS will rock the Milwaukee Summerfest on Saturday June 27! The show will take place at the Marcus Amphitheater. For more info on the 2009 Summerfest visit http://www.summerfest.com/. Design By Hümans is excited to present it's newest DBH Music Series contest partner! Fresh off their American Idol performance with Adam Lambert, let's welcome KISS! Amoeba Music has done a segment called "What's In My Bag" with Ace Frehley. Ace mentions that he "roadied" for Jimi Hendrix when he was 18 years old. OVER 1 MILLION YOUTUBE VIEWS! Wow! We're already over 1 MILLION YouTube views of our American Idol appearance where we were joined by finalist, Adam Lambert. By all reports, it was the high point of the show, and this seems to confirm it! Adam, we are sure is destined for great things and with supreme confidence and pride we can promise you that the new KISS album and tour will show you that we are in peak form and never better. You never fail to amaze us. Now it's our turn! 1977 May 26 - The blood KISS had "donated" is mixed with the ink at Borden Ink Plant, Depew, NY, for the first KISS Marvel Comic. 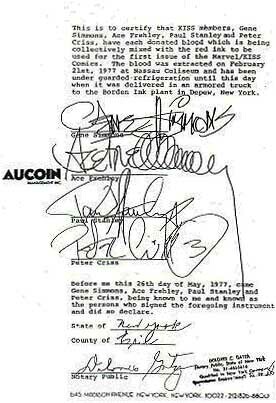 View the "Blood Contract" here. As Americans we need to remember that the day we see as a holiday is actually a time to pay tribute and remember all the brave members of the Armed Forces fighting on our behalf, facing the ultimate sacrifice daily. 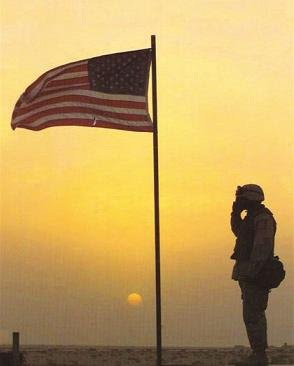 KISS remembers and honors all our brave soldiers lost in all wars and prays for the safe return of all those fighting now. KISS fans win awesome band prizes at SearchWithKiss.com every day. It's easy. It's free. And you could be next. New KISS prizes will be added to the band's official Swag Store later this week - Go to http://searchwithkiss.com/ . Wherever the web takes you, bring KISS along for the ride with the official search toolbar. Download yours today at http://searchwithkiss.com/ and start winning even faster! And don't forget to invite your friends to SearchwithKiss.com - every time they win a Swag Buck, you will to. Do it here: http://searchwithkiss.swagbucks.com/?cmd=sb-refer . Search with KISS is a search engine powered by Google and Ask.com, except here every web search is a chance to win "Swag Bucks" which can be redeemed for KISS prizes and high end electronics. Simply make www.searchwithkiss.com your homepage and use it everyday just like you use Google and any other search engine. Each day many random winning times will be selected, if you search after one of these times and your search is a winner - you'll win a Swag Buck. You then simply redeem your Swag Buck at the official KISS Swag Store for the prize you want and it'll be shipped right to your door! 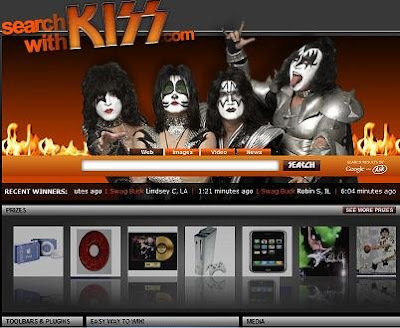 KISS's amazing search toolbar makes it easy for you to search the web and win prizes from the band. This great toolbar also features a logo and quick links including direct access to Kissonline.com, news, tour dates, fan letters, KISS store and much more. The toolbar is compatible with PC's running Internet Explorer and has NO adware, spyware or anything that can harm your computer. If you are using Firefox or IE7, you can also download the KISS search plug-in so you can search the web right from your browser. The Firefox plugin is available at: www.searchwithkiss.com . On May 25, 2006 - KISS joined Queen, Def Leppard and Judas Priest as inaugural honorees of "VH1 Rock Honors." "VH1 Rock Honors" was launched by the network to pay homage to the gods of hard rock! The event took place at Mandalay Bay in Las Vegas and included live performances by each of the bands. KISS performed "Detroit Rock City," "Deuce," "Love Gun" and an unscheduled "Makin' Love." Right before the KISS set, an ALL STAR band featuring Ace Frehley, Rob Zombie, Tommy Lee, Scott Ian, Gilby Clarke and Slash, ripped through a brutal version of "God of Thunder" honoring KISS. Today in KISStory: 1999 - Paul Stanley plays the "Phantom"
May 25, 1999 - At Pantages Theatre in Toronto, Paul Stanley takes to the stage playing the lead role, The Phantom, in Andrew Lloyd Weber's Phantom Of The Opera. 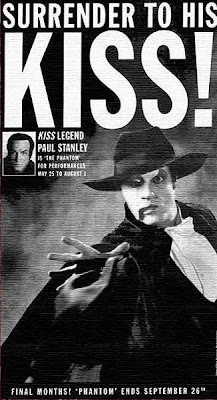 The ad above was taken out of the Toronto Star newspaper and advertises Paul as the Phantom. KISS is featured in the Spanish Metal Hammer #2 Poster Magazine Special. The issue contains 8 KISS posters, as well as KISS on the front and back covers! Thanks to Javier Rueda for the image. 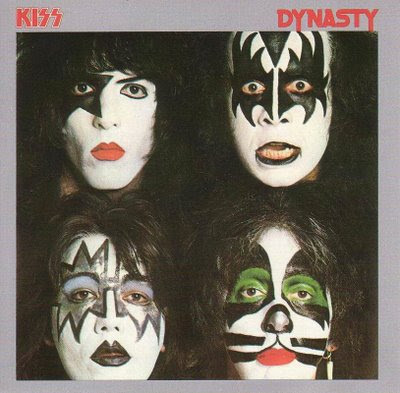 Today in KISStory- 1979 - The album 'Dynasty' is released. 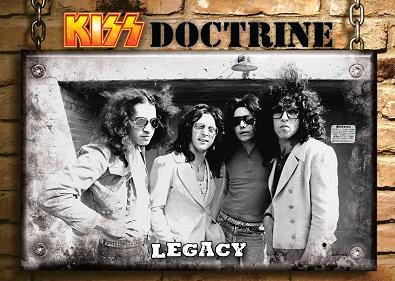 While "I Was Made For Lovin' You" remains a permanent staple on the band's shows, much of the album's songs (other than "Sure Know Something," and "2000 Man") have rarely been played live after the Dynasty tour. In 2006, Paul Stanley resurrected "Magic Touch," which was played every night on the "Live to Win" tour. So many people have been requesting additional images of the new KISS Costumes, we decided to make a special page describing exactly what you get as you open the package. 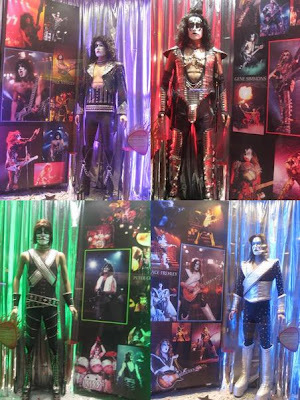 We here at KISSmuseum.com have handled and sold many authintic KISS costumes in the past and we must tell you, these replica costumes have a similar look and feel to the real thing. An absolutely amazing collection! This is the big one - the Gene Simmons costume is a behemoth of KISS apparel. We start off with it's packaging - The small suitcase-sized zippered garment bag opens up to reveal the intricate maze of fabric, "leather", ties, buckles, clasps, hooks and straps; all made with one purpose in mind - to transform you into a likeness of the Demon himself! The body suit is made of heavy-duty spandex with imitation leather and metal stud accents. Next comes the wings, chest and cod piece. The get-up is so elaborate it even comes with a detailed, illustrated instruction sheet. This is a surprisingly heavy set of pieces. Made of heavy, thick yet supple imitation leather with hundreds of large metal studs. And to top it all off, the cod piece is stuffed to the max! Finishing things off, there is a pair of spandex gloves with soft silver spikes protruding from the knuckles. And when you place the metal-studded collar around your neck, you know you're cool. Even comes with a packet of replacement metal studs of different sizes. More images and info on the Gene Simmons Costume can be found here . The KISS / Adam Lambert American Idol Medley clip is now available for purchase at iTunes. The clip is currently #1 on iTunes Top Music Videos! Apparently, "Kissteria" will be coming. According to PR on the Greif Company (co-producers of Gene Simmons Family Jewels show) website, "For the first time in their 35-year career, rock icons KISS give you an all access pass to the "Alive 35" Australian Tour. When Paul and Gene decide to launch a spontaneous mini-tour with only one week's notice the entire KISS family must scramble to make it a reality. Malfunctioning pyrotechnics, faulty flying righs and missing drummers are the least of their challenges." No other details currently known. 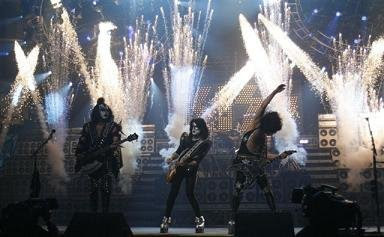 KISS has seen a bit of a sales spike due to its appearance on "American Idol" on Wednesday, May 20. As of this morning, "Rock And Roll All Nite" is No. 12 on iTunes Top Rock Songs list, with "Beth" at No. 22 and "Detroit Rock City" at No. 52. Over at Amazon, "The Very Best Of Kiss" compilation is No. 1 in the Hard Rock & Metal > Pop Metal Bestsellers category. Other KISS albums charting as of this morning are "Alive!" (No. 23), "Destroyer" (No. 29), "Creatures Of The Night" (No. 41), "Gold" (No. 56), "Dressed To Kill" (No. 59), "Rock The Nation" DVD (No. 60), "Lick It Up" (No. 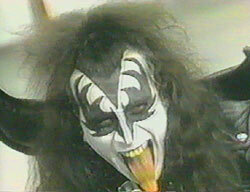 62), "Gene Simmons" (No. 67), "Ace Frehley" (No. 71), and "Greatest Kiss" (No. 82). As of 2008, iTunes is the No. 1 retailer of music in the United States, with Amazon at No. 4. 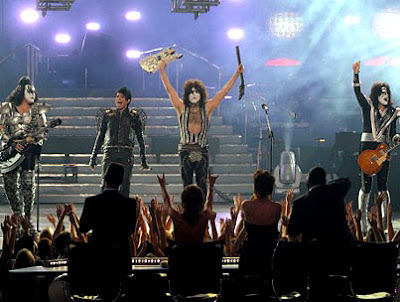 KISS played to one of the biggest crowds of its career on the season finale of "American Idol". According to TV By The Numbers, the show was seen by 28.8 million viewers. According to TV By The Numbers, the American Idol finale was viewed by an average of 28.8 million viewers. That makes it one of Kiss' most viewed TV appearances ever. The American Idol finale averaged 28.8 million and a 10.0 rating among adults 18-49 in time zone adjusted preliminary numbers between 8pm-10:07pm. Last year’s two hour Wednesday finale drew 30.6 million and a 11.0 rating with adults 18-49 in preliminary (non time zone adjusted) numbers. In the final live plus same day ratings numbers for last year’s finale, Idol wound up at 31.7 million and an 11.4 adults 18-49 rating. Since the time zone adjusted preliminary numbers will likely track closely with the finals it looks Idol was down around 9% in total viewers and 13% for adults 18-49. DVR viewing beyond the same night might bring things a little closer to last year, but we won’t know for a few weeks. For anyone who cares, in the NON time-zone adjusted numbers, Idol averaged 27.71 million and a 9.6/27 (rating/share) with adults 18-49 between 8pm-10pm. Gene: "Respectfully, I don't think Adam is a rock singer. He sounds much more convincing singing ballads, and Broadway shows. His voice doesn't seem to have a "rock quality." But, I'm sure he's going to do just fine." KISS Army Missouri and The Mississippi Mudhouse is Proud to Present The Cape Girardeau KISS Fan Convention Saturday June 13th at the Mississippi Mudhouse in Cape Girardeau, Missouri from Noon to 7 PM. 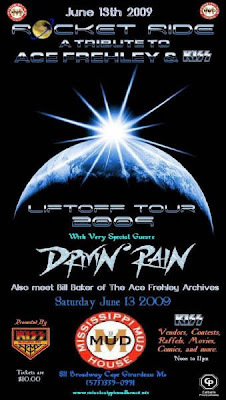 Special Guest will be Bill Baker of the Ace Frehley Archives and he will be on hand for a Meet and Greet and autograph copies of his book "Ace Frehley: the Ultimate Scrapbook"! He will also show the film "KISS Loves You", a Documentary about the band and the birth of the KISS Conventions! Also Planned events for the day as well will be a showing of ?the original 1978 classic "KISS MEETS THE PHANTOM OF THE PARK" on the big screen. Also there will be a KISS TRIVIA CONTEST. This will be set up like a Spelling bee; each person will be asked a question and whoever can't answer it will sit down and we will keep going until there is 2 left, then its really going to be fun! KISS AIR GUITAR CONTEST. Show you got what it takes to rock n roll all night! Judges are three local rock guitar players. Michael Stewart (Drivin Rain, TNT, Killer Dwarfs), Duke Jackson (Strikeforce, Herman Ze German), Chase Wright (Fists Of Phoenix, and Shivelbines Music),(KISS COSTUME CONTEST) - Whoever has the best costume and the Crowd will judge the winner of this event! We'll make up a special one day only KISS MENU. Venders will be on-hand. Potions of the Proceeds will be going towards several local charities. We'll end the night with a full blown rock n roll concert. This will Start at 7PM - 11PM! The Ace Frehley Tribute band ROCKET RIDE and Local band DRIVIN' RAIN will be performing after the Convention! Everything starts at Noon. Tickets are $10 Dollars in Advance and can be ordered by calling 573-339-0991. Tickets will be $15 Dollars at the door. The Mississippi Mudhouse is located at 811 Broadway Street, Cape Girardeau, Mo, 63701. KISS Rocks with Adam Lambert! "American Idol" runner-up Adam Lambert brought down the house in a performance with KISS -- see what the band had to say about performing for the "Idol" audience! 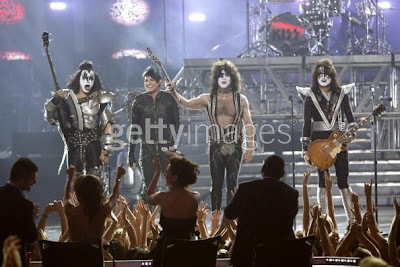 AMERICAN IDOL WINNER - KISS! My 12-year-old son even has KISS on his Ipod. Hey KISS & the KISS ARMY! I visited the Henry Ford Museum in Dearborn Michigan today at the" Rockstars Cars and Guitars" Exhibit featuring KISS! The Jonas Brothers, KISS and Sheryl Crow are among heavy hitters represented at the second "tour of cool" in the "Rock Stars' Cars & Guitars 2" exhibit. More than 20 cars and 50 guitars and other rock memorabilia, including costumes and props, will blast into the Henry Ford Museum in Dearborn, May 16-Sept. 7. The cars and guitars come from rockers' personal collections, the Rock and Roll Hall of Fame and Museum Inc., and the Experience Music Project. There is also a special section that pays tribute to locals who have made it big. A KISS ARMY Members-Only ticket presale for the KISS show at the Marcus Amphitheater Summerfest begins Friday at 12PM (PST). 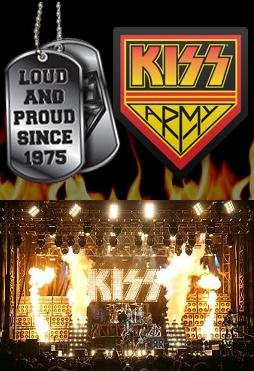 If you are a Premium KISS ARMY Member: LOGIN - http://www.kissontour.com/service.php?module=login . If your membership to the KISS ARMY has expired: RENEW - http://www.kissontour.com/service.php?module=subscribe_step_one . KISS appear on the 'Mike Douglas Show.' Gene is elected to go out and talk with Mike and the other guests. KISS perform 'Firehouse' on the show. Host Mike Douglas was flabbergasted at Gene’s statement that he represented "evil incarnate." 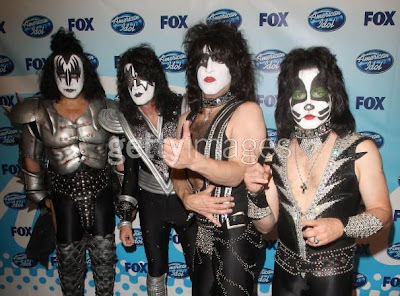 CLICK HERE to visit Getty Images American Idol KISS Gallery. "KISS - BEST THING ON IDOL ALL SEASON"
" - BEST THING ON IDOL ALL SEASON"
9:21 pm: KISS Meet The Phantom of the Park had nothing on KISS Meet The Phantom of The Glamb-Screech! 9:24 pm: That was even greater than Cyndi with Allison. To recover, I’m going to need some cold gin, tequila, vodka and orange juice. 9:26 pm: Well, THAT was a star. Maybe if Adam doesn't join Queen as their new lead singer, he could tour with KISS. 9:28 pm: This is so my now it’s not even funny. Adam rocking (and rolling over) with KISS was just about the best thing on Idol ALL SEASON LONG. KISS performed with finalist Adam Lambert on tonight's American Idol finale. Adam took to the stage singing the KISS classic "Beth". In perfect KISS fashion, Paul, Gene, Eric, and Tommy hit the stage and joined Adam for amazing rendition's of "Detroit Rock City" and "Rock and Roll All Night". KISS' upcoming U.S. and Canadian tour will be the world's first to put fans in charge of where their favorite artist plays. By partnering with Eventful, the leading social media company for events, fans will "Demand" where KISS will perform on their latest trek across the top-voted North American markets beginning this September. No matter where the fans say — from stadiums to cornfields — if there are enough votes, KISS will be there! And in order to keep the competition fair for smaller cities, final site selection will weigh population size versus total votes. 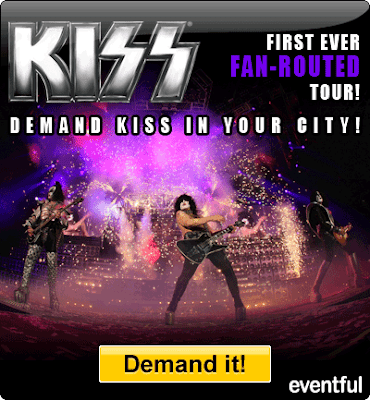 Fans across the U.S. and Canada can cast their votes at www.eventful.com/KISS to have their town included on the KISS 2009 North American tour. Fans are able to vote, and check the tally of what cities are in the lead, 24/7 across the web at the previous sites; as well as on KISS' MySpace and Facebook, Ticketmaster's KISS page, VH1Classic.com, and many more. - First, could you please introduce yourself and tell our readers about your company? My name is Jesse, and I'm 27 years old. I've worked for Press Pass since I graduated college in 2005. My first product release was our Elvis Lives set in 2006. Although KISS became famous before my time, I'm fascinated by their ability to market the KISS brand. Very few bands have remained relevant as these guys have throughout their career. It is an honor to be able to work with the band to market products for one of the most respected and recognizable brands in the entertainment industry. KISS is a great fit for Press Pass. Our company was founded in 1992 and much like KISS, we were quick to shake up the industry and make our presence known. We staked our claim as a trendsetter by incorporating the first athlete-worn memorabilia in our products, a practice that other card companies were quick to follow. Our core business is NASCAR trading cards. However, our entertainment trading card releases are widely popular, especially KISS! - Who got the idea of the new KISS Ikons Trading Cards? The Vice President of our company, DJ Kazmierczak, is a huge KISS fan, and he has followed the band since he was a kid. Several others in the office, including the designer for the KISS set, are fans of KISS. However, one of the biggest reasons we decided to produce KISS trading cards is their resurgence in 2009 with their tour and upcoming album. KISS is everywhere now ? online, TV commercials, radio interviews, their tour, their album, etc. The band is rockin' just as loud as they were 35 years ago, and the fans love it. - The KISS franchise lent itself to many successful trading card series in the past, with companies like Donruss or Cornerstone. Is it something you had in mind when you threw yourselves into this venture and did it make your task harder? The KISS Army has had a few trading card sets to collect throughout the years, and some of them were good. However, we felt that there were a few things missing from these sets, and we wanted to help the fans get to know KISS even better than they already do while also delivering good value to collectors. Any KISS fan can tell you Gene's real name or what Peter Criss' Rolling Stone advertisement said, so we wanted to dig a little deeper and offer fans some behind-the-scenes insight from the band members themselves that fans may not already know. Each card in KISS Ikons has a direct quote from someone in the band or close to the band which reveals some fascinating information. This kind of info gives KISS Ikons some real value and truly sets our product apart from the others that have been done. Another aspect of our product that makes it unique is the inclusion of authentic memorabilia. Where else can the KISS Army obtain a piece of authentic memorabilia worn by the Demon himself?! The signed 8x10 photographs are also unique to this product and give fans and collectors the chance to own an authentic signature from Gene and Paul. Overall, KISS Ikons offers incredible content and value that surpasses any other set that's been on the market. - At which level were KISS involved in the KISS Ikons Trading Card making process? Despite being in the midst of a very busy year, the band is still very proactive with their licensees. They approve the cards and correct any inaccuracies, and once the set was finished they were extremely impressed with the end result, and they were very anxious to receive their samples. KISS has been great to work with because although their focus is promoting and protecting the KISS brand, they still allow their licensees to get creative with their products, which results in some really awesome collectibles. - I myself am an avid KISS card collector and I must admit the KISS Ikons Trading Cards are unique because of their artistic touches, something the previous KISS card series lacked. Who was in charge of the design? Press Pass has an amazingly creative in-house design team, and the individual that designed this set, Eric Peterson, also happens to be a huge KISS fan. Working on this set was a dream come true for Eric, and he's definitely enjoying all of the rave reviews the product is receiving. A few of the tattoos were also done by an in-house artist and tattoo enthusiast, Tonya Clarkston. Tonya did an amazing job blending classic tattoo artwork with each band member's ikonic image. - Do you think the KISS Ikons Trading Cards could be followed by a new series in a near future? Definitely! The second set, KISS 360, will release in August 2009, and I think it might actually top what we've done with the first set. Stay tuned for updates on our second KISS trading card release. - Any possibility of a distribution in Europe? KISS Ikons is currently sold in the UK, and we're working to expand our European distribution with our next release, KISS 360. Thanks a lot for your time, Jesse! 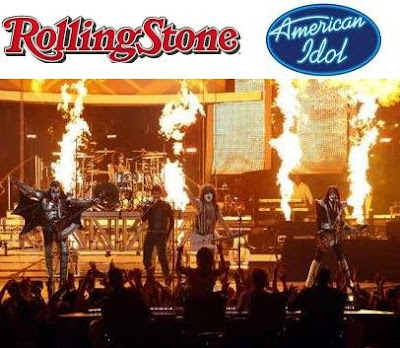 Rumors Fly About Star Performers as “American Idol” Finale Nears - KISS? The Definites: Season Four winner Carrie Underwood, arguably the biggest star the show has ever produced, will perform her cover of Mötley Crüe’s “Home Sweet Home,” which has been used as this season’s farewell song. Jason Mraz confirmed on his Website that he will perform on the show. The Definitely Maybes: According to the AP, the Black Eyed Peas, Cyndi Lauper, Lionel Richie, Keith Urban, Carlos Santana, Queen Latifah and last year’s Idol champ David Cook will all appear on the finale. CMT reports Urban will duet with Kris Allen, while Idol fansite MJ’s Big Blog says Lauper will sing with the equally rambunctious Alison Iraheta, who finished fourth this season. The Maybes: We’re really hoping this rumor is true, especially since our sister mag first reported it: KISS will appear on the Season Eight finale, US Weekly reports in their new issue. The make-up-heavy rockers would serve as a perfect backup band for Adam Lambert — who RS’s Rob Sheffield thinks single-handedly saved Idol — but apparently AI producers have other plans for their glam hero. In the most outlandish and fantastic rumor of the Season Eight finale, MJ’s Big Blog says that producers are trying to lure David Bowie, who has not performed live since 2006, to duet with Lambert on Wednesday night. Seems far-fetched, but what better way to announce your return to the stage than with a performance in front of millions of viewers. The special guests and our new American Idol will be revealed on Wednesday’s finale. But first, come back tomorrow when Rob Sheffield live-blogs the performance show. And stay on top of all of all our Season Eight coverage in one spot.